flexible, and offer a wide array of features – all with surprising value. Yealink’s video conferencing systems’ leading-edge technology, simplicity of deployment, and ease of use helps your business use video collaboration as tool facilitate communication and save money, and their interoperability extends video conferencing out from the conference room, to the desktop and anywhere globally with smart phones or tablet PCs. With feature-rich design and architecture that integrates with existing systems, Yealink collaboration solutions are easy to deploy in any environment. An excellent user experience and cross-platform per-formance promote adaptation. Combined with their excellent price points, Yealink’s products bring real value to audio and video collaboration. Perfect Video Conferencing is proud to feature several Yealink collaboration devices as part of our port-folio of products carefully selected to bring the best solutions to our customers. An advanced video conferencing solution for smaller meeting rooms has never been more simple or affordable. The Yealink VC110 is a powerful, all-in-one video collaboration product with advanced fea-tures and firewall-compatible configurations that mean it can be up and running in just three minutes. Its ability to support a dynamic adaptable bandwidth with an 8 percent packet loss resistance means video conferencing with no hiccups, even in fluctuating network conditions. As with any Yealink solu-tion, interoperability with other systems is all part of the package. The V110 package includes the VC110 codec and cable hub, the wireless VCM60 micpod, and a 4x dig-ital PTZ camera, as well as remote control. 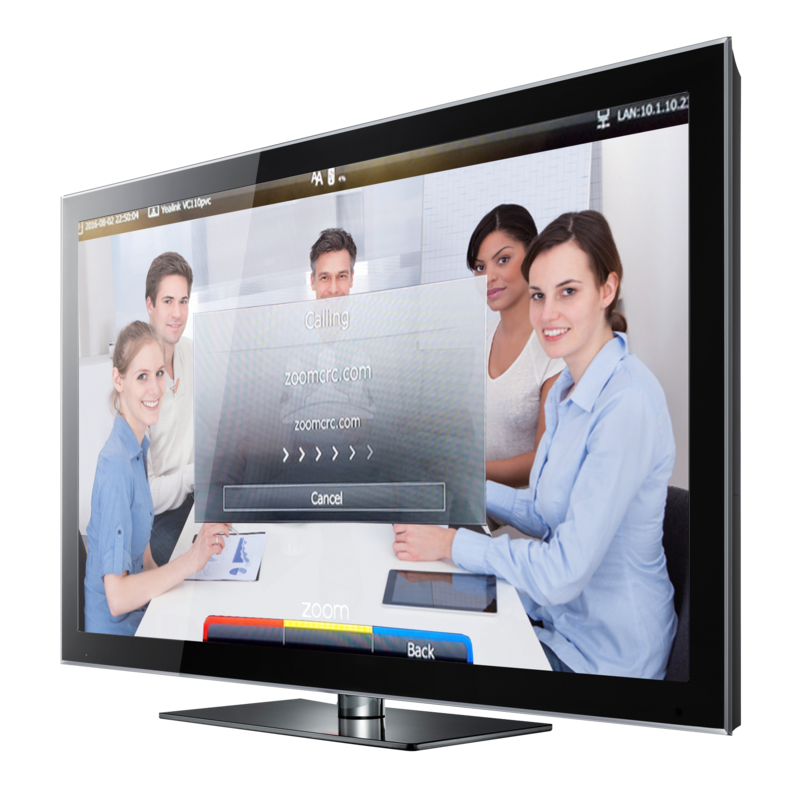 This package delivers an excellent video collaboration expe-rience at a tremendous value. Yealink modifies the native interface and optimizes the user experience for navigation into a Zoom meeting room enabled for SIP and H323 integration. Like the standard VC110, this system offers an advanced video conferencing solution for smaller meeting rooms has never been more simple or affordable. For full details about the VC110, see the specifications above. We offer free demos of this device and full Zoom licenses at no cost to you. Through 2016 we are also offering pricing incentives for this powerful bundle. Every huddle room can be powered by this exciting offer from Yealink. Designed for medium-sized conference rooms, the Yealink VC120 is their latest innovation in 1080P full-HD video conferencing. Supporting dynamic adaptive adjustment and an 8% resistance packet loss, the V120 insures an excellent video collaboration experience. Intelligent Firewall Traversal means you can plug and play without any additional firewall configuration. Your video conference is up and running in no time, and with its high level of interoperability and interconnection, that means video collaboration can take place across multiple devices: video phones, tablets and smartphones. Yealink modifies the native interface and optimizes the user experience for navigation into a Zoom meeting room enabled for SIP and H323 integration. Like the VC120 line, this Zoom enhanced so-luteon is designed for medium-sized conference rooms. Zoom integration simplifies the conference room experience and allows customers to have a simple, supported and scalable end-point in every Zoom conference room. The VC 120 V120 insures an excellent video collaboration experience. It looks like a phone, but it’s so much more. The T49G brings high-quality video collaboration directly to the desktop phone. With an 8-inch LCD touch screen not only providing HD video but also access to a vast array of features, this is the ultimate pairing of audio and video in connecting you with your cus-tomers, partners, stakeholders and colleagues right at your desk. The T49G video collaboration phone has 802.11 a/b/g/n Wi-Fi connectivity, Bluetooth 4.0 with En-hanced Data Rate technology which results in more rapid data transmission. Combined with the HDMI output it give you the capacity for high quality media exchanges. With all the features of the T49G, you’ll wonder if there’s anything it can’t do. The Yealink product line integrates HD video and audio with simplicity, interoperability and functionality across devices at an unexpectedly cost-effective price. Learn more today about how Perfect Video Conferencing can help you experience the Yealink difference.